Warm and balmy days are on the way, which means it’s time to add the best summer bass lures to your tackle box. 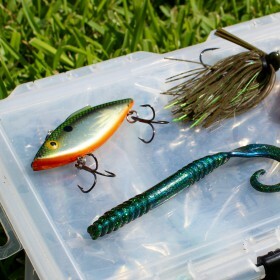 Not sure which lures will help you score a largemouth on the warmest days of the year? Check out five bass fishing lures that have proven themselves by producing bites even as the mercury climbs above the 90-degree mark. During the heat of summer bass will often move to cooler, shady areas near the bottom of the water column. This is why soft plastic worms, rigged either Texas or Carolina style, are warm weather winners. The Texas rig is generally a better choice when fishing in shallow spots with heavy cover or vegetation, whereas the Carolina rig excels when used in deep water as a search lure. Grab your heavy to medium heavy fishing rod and a skirted jig if you want to learn how to fish for big summer bass. Skirted jigs are among the most versatile lures you can use this time of year. You can flip a jig into heavy vegetation, cast it out near structure, work it along drop-offs, or drag it along the bottom. The larger profile of a skirted jig tends to be the ticket when it comes to coaxing lethargic bass into biting during periods of hot weather. Spinnerbaits can be some of the best summer bass lures to use when fishing muddy or murky waters because of the flash and vibration they give off. Try casting a spinnerbait along grass edges or near drop-offs, and then use a slow-rolling retrieve to bring it back toward the boat. These fishing lures are ideal for bumping around structure on sunny days when bass seek the shade provided by logs, branches, or thick vegetation. Lipless crankbaits can be great bass fishing lures to use during the early summer months when schooling fish may be located at various depths. The reason for this is that lipless crankbaits can be fished in either shallow or deep water just by switching up the speed of your retrieve. Add lipless crankbaits to your fishing tackle box that resemble the resident baitfish at your summer fishing spots. Are there plenty of lily pads at your favorite summer bass fishing spot? If so, you should know that topwater frogs are some of the best fishing lures for bass you can use around lily pads. Bass like to hold underneath the shade of lily pads on hot summer days, which means that hopping a topwater frog from leaf to leaf can be quite effective at enticing bass to bite. Now that you know about five fishing lures for bass that will work well throughout the dog days of summer; don’t forget to buy or renew your fishing license online, check for any changes to the state fishing regulations, and get your fishing gear ready to go!